The storm might be over but that doesn’t mean the danger is. Take steps to protect yourself and your loved ones during your cleanup after a hurricane, flood, or other natural disaster. Follow these cleanup tips and monitor your radio or television for up-to-date emergency information. Get support from family members, friends, counselors or therapists. Avoid contact with power lines and take extra care in cutting trees or branches that are bent or caught under something else. In hot weather, try to stay cool by staying in air-conditioned buildings, taking breaks in shaded areas or in cool rooms, drink water and nonalcoholic fluids often, and wearing light and loose-fitting clothing. For more information on protecting yourself against heat-related illness, see the CDC Extreme Heat Web site. Clean up and dry your home quickly after the storm or flood ends-within 24 t0 48 hours if possible. Thoroughly clean all wet items and surfaces with hot water and laundry or dish detergent. For example, you’ll want to clean any flooring, concrete, molding, wood and metal furniture, countertops, appliances, sinks and other plumbing fixtures. 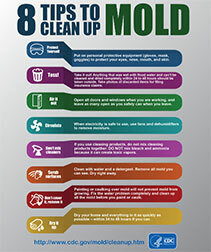 See Mold After a Disaster, CDC Flood Web site, and Homeowner’s and Renter’s Guide to Mold Cleanup After Disasters or more information on safely reentering flooded homes, cleaning up flood or storm water, worker safety issues and mold cleanup issues. You may not be able to kill germs on some toys – like stuffed animals and baby toys. Throw out toys you can’t clean. When using 5-6% unscented liquid household chlorine bleach – add a little less than 1/8 teaspoon (8 drops or about 0.5 milliliters) per 1 gallon of clear water. Stir well and let it stand for 30 minutes before using. If the water is cloudy, add a little less than ¼ teaspoon (16 drops or about 1 milliliter) per 1 gallon of water. When using 8.25% unscented liquid household chlorine bleach – add a little less than 1/8 teaspoon (6 drops or about 0.5 milliliters) per 1 gallon on clear water. Stir well, and let it stand for 30 minutes before using. If the water is cloudy, add 12 drops (or about 1 milliliter) per 1 gallon of water. To reduce cold-related risks when standing or working in water which is cooler than 75 degrees F (24 degrees C), wear insulated clothes and insulated rubber boots, take frequent breaks out of the water, and change into dry clothing when possible. Wait until daylight to return to buildings so it’s easier to see and avoid any hazards – especially if the power is out. Leave your home or other building if you hear any shifting or strange noises – this could mean it’s about to fall. If you smell gas or suspect a leak, leave your/building and contact emergency authorities right away! Don’t turn on the lights, light matches, smoke, or do anything that can cause a spark. Don’t return to the building until you’re told it’s safe to do so. Never use generators, pressure washers, or other gasoline, propane, natural gas, or charcoal-burning devices inside your home, basement, garage, or camper – or even outside near an open window, door, or vent. Carbon monoxide – an odorless, colorless gas from these sources that can cause sudden illness and death – can build up indoors and poison the people and animals inside. If electrical circuits and electrical equipment have gotten wet or are in or near water, turn off the power at the main breaker or fuse on the service panel. If you must enter standing water to access at the main power switch, then call an electrician to turn it off. Never turn power on or off or use an electrical tool or appliance while standing in water.